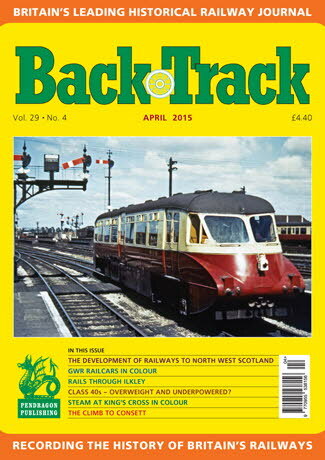 Railway Magazine | BackTrack April 2015 journal from Pendragon Publishing. Class 40s: Overweight and Underpowered? - Andrew James presents a case study on the West Coast Main Line. The Railways and Class - George May sets down some thoughts on the contrasting standards of railway travel. Going by Western Railcar - four colour pages of the pioneering GWR diesel railcars. North Wales Branch Lines - four pages of archive photos on a range of byways including Blaenau Ffestiniog, Caernarvon, Amlwch and Denbigh. The Development of Railways to the North West of Scotland - Giving Access to the Western Isles - In Part One Peter Tatlow looks at some initial construction plans. Steam Supreme at King's Cross - four colour pages of the East Coast route terminus. The Woes of Westinghouse - R. A. S. Hennessey considers teething problems at the Trafford Park Works. 'From Lake Geneva to the Finland Station': Lenin crosses Europe by rail - Geoffrey Skelsey tracks an epic rail journey during the Great War. Rails through Ilkley - David Joy describes the lines serving an important Yorkshire Dales town. Fire and Rescue - two colour photos of a fire brigade exercise in Sussex in 1989. The Climb to Consett - Glen Kilday looks at the 1961 working timetable for the iron ore trains from Tyne Dock.